We are in the mountains high above Malaga, chasing a white 911 GTS convertible. Make that trying to keep up with a white 911 – the man at the wheel is a former racing driver doing his best to remove my new 718 Cayman GTS from his rear-view mirror. The fact that he fails is almost exclusively due to the astonishing abilities of the new Cayman, which threatens to topple the big brother hierarchy when pitted against a 911. 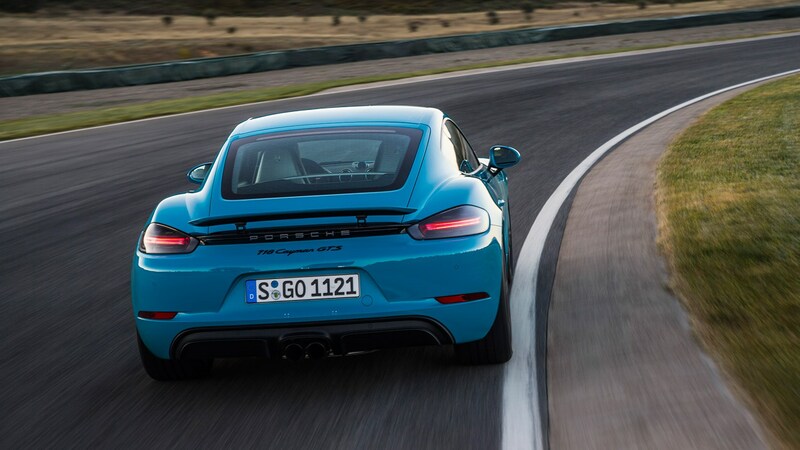 Obviously it’s beaten on power – its 360bhp engine is 84bhp down on the 911, though makes 25bhp more than the old Cayman GTS. But that’s not the whole story. The Cayman’s 2.5-litre turbocharged flat four is lighter, more compact and less thirsty that the coveted six. And the entire car is significantly lighter too (1405kg vs the 911’s 1440kg). Add in the Cayman’s well-balanced sports suspension, which lowers the centre of gravity by 20mm compared with the standard model, and the mid-engine layout, and the 911 has a problem. In terms of handling, the Cayman has the edge. The weight distribution is not as tail-happy, the cornering grip on warm tyres has that magic touch, the precise steering relays all the road contact you could ever ask for straight to the fingertips, the brakes got me out of a tight spot more than once and the diff lock processes power and torque with minimum fuss and maximum efficiency. There is a downside to the extra weight on the front axle, though – through downhill bends, and whenever you overdrive the front tyres, you can expect sudden understeer. Catching it may require a stab at the brakes. Which Porsche 718 Cayman should you buy? But realistically the biggest enemy of the Cayman GTS isn’t the 911, it’s the Cayman S. It costs £8000 less and makes 345bhp, so the difference in absolute performance is negligible. With Sport Plus and launch control activated, the GTS thunders to 62mph from zero in 4.1sec. The S takes only one tenth longer and its top speed of 177mph is only 3mph slower than the GTS’s. There’s more to this than numbers, of course. The GTS gives better feedback, has sharper responses and finer balance. If you ignore the traditional numbers and instead count the butterflies in your stomach before each drive and your heart-rate on a challenging road, the GTS wins. It’s a more exciting car than the S.
Much depends on which drive programme you select via the joy knob on the steering-wheel though. In Normal mode, the ride comfort is okay. In Sport, the drivetrain sharpens up. And in Sport Plus, the entire tech-mech assembly redoubles its efforts. Left to its own devices in Normal mode, the ECU selects the tallest possible ratio from the PDK dual-clutch gearbox as soon as it can. Trundling along at 1700rpm in seventh gear may save trees, but the engine sounds coarse and unpleasant. In Sport, gearchanges are notably quicker and throttle response is brisker. In previous Porsches, Sport Plus was only good for the racetrack. 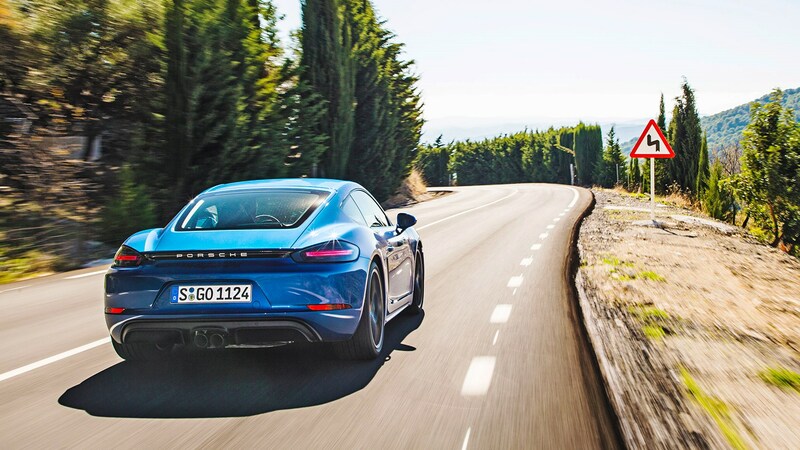 In the new Cayman GTS, however, the calibration is less extreme and okay for public roads. Keep the hoof firmly planted in Sport Plus and the master chip will punch the ratios through like an electro-mechanical Rocky Balboa. Even though the engine delivers its peak 360bhp at 6500rpm, there are 1000 more revolutions to play with, and the gearbox uses them all. It’s a busy rhythm which makes a lot of mostly beautiful noise as it keeps hitting the sweet spot between over-ambitious and under-challenged. When exiting corners, the white 911 still pulls away with vigour but 200 metres later the Cayman gains ground under braking, and it feels a blink quicker through first-gear spirals and second-gear esses. While the first three ratios sit relatively close together, the top four gears are set further apart for the sake of fuel economy. Although there is a feisty 317lb ft available from 1900 to 5000rpm, the gearbox needs to be prepped by the driver to make full use of that punch. The new 718 Cayman GTS is a master in terms of sensory punch, too. Stimulating visual factors include the revised front bumper sporting a bigger air intake, darkened head- and tail lights, twin exhaust pipes framed by a charcoal diffuser, black wheels shod with 20-inch tyres and a couple of prominent air deflectors. Inside, we find racing buckets, wall-to-wall alcantara trim, no-cost Sport Chrono clocks and plenty of anodised brightwork. Still absent from the wish list are a head-up display and any but the most basic assistance systems. The most annoying feature is the admittedly improved touchscreen, which on bumpy roads typically needs two or three approaches before the index finger eventually arrives at the target. In terms of options, you would not want to be without Porsche’s infotainment system (PCM) and the reversing camera, but there is no real need to spend big on carbon-ceramic brakes or to spend small on the Sports Pack. So which Cayman to buy? The 296bhp base model does not deserve its wallflower image. It is attractively priced at £42,897 and is quick enough except perhaps for track outings and particularly furious Sunday mornings. Having said that, the 2.0-litre engine is probably better suited to the Boxster. The Cayman S strikes a compelling compromise – it easily wins the value-for-money competition and is the perfect choice for those who don’t appreciate the GTS livery. The GT4 returns next spring, but since all my rich aunts and uncles are still fit and well, it unfortunately doesn’t enter the equation. The GTS polarises. It is expensive, it does not have a clear edge on performance, and the top-of-the-line four-cylinder unit is no more refined than the lesser engines. On the other hand it looks sexier, has a potentially higher resale value and when everything falls into place – road, traffic, attitude – the 360bhp Cayman easily matches the 444bhp 911 in grins-per-mile. Plus, as the ex-racing driver in the white example ahead is discovering, the GTS’s outright speed can easily embarrass its big brother.